In December 2013, our beloved Coach Pete unexpectedly passed away. Coach Pete was our optimist leader. He taught our team the price of athletic mastery is through preparation. Preparation which at times will be challenged, and with it comes a mind set to overcome. His confidence in our team to succeed is defined through hard work and persistence. It is because of Coach Pete and our team Leaders that we have always found strength in adversity to reach our goals. The Philadelphia Police Boat Team fourteen-year history has proven memorable, challenging and exhilarating with many Federal, State, local law enforcement and Fire Fighter paddling members. Our leaders, Detective Frank McClain and beloved coach, Detective Pete Vargas, are at the helm of many of the teams’ great achievements-past, present and future. 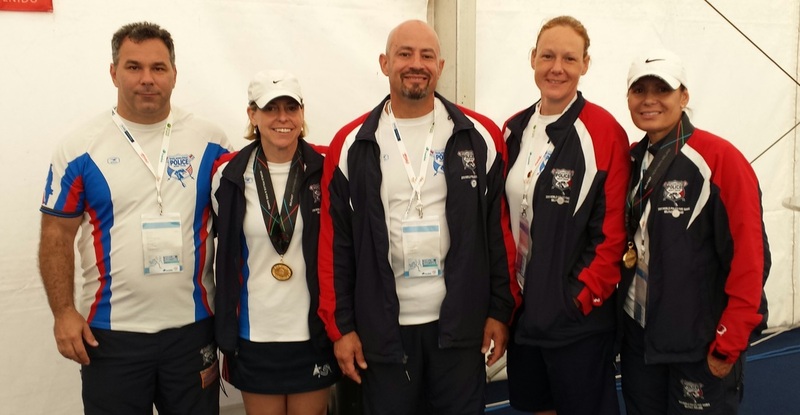 In August 2013, our team traveled to Belfast, Northern Ireland, to proudly represent the United States of America in the World Police and Fire Games (WPFG). Under the coaching leadership of Detective Pete Vargas, the Dragon Boat team captured Gold defeating Canada and Australia, a first team achievement on an international platform. In September 2013, Coach Pete lead a team of 6 paddlers in the Atlantic City Outrigger Canoe (OC6) Ocean race, a water venue known to have a menacing temperament and a large Poseidon statue fixed on its sand to emphasize that fact. At the start, the race quickly proved very challenging for paddlers as teams fought eight to twelve foot hard hitting, violent swells. Within minutes, our OC6 hullied (flipped over) in the turbulent, aggressive water making it the most challenging race to upright our canoe even by our experienced paddlers. Once upright, the loss of bailers proved even a greater challenge. Larger and larger forceful waves continued to crash on the canoe, dragging the team over a mile out to sea with no ability to bail. All the while, our canoe and paddlers were repeatedly submerged under thousands of gallons of water, however, never once did any of the paddlers give up nor leave their submerging boat. The fight was now between Poseidon, not the other OC 6 teams. For over an hour, the team tirelessly attempted to save the canoe and themselves in this ocean fight. With each hard hitting wave, it was clear Poseidon was going to win. The paddlers could hear the canoe breaking bit by bit. It was time for the paddlers to be rescued by a chase boat which was also taking on water. Coach Pete, as the captain of our ship, refused to be rescued and desperately wanted to find a way to drag the canoe back to shore. He was the last person on the canoe when a fifteen foot wave finally swallowed him and our canoe, breaking the canoe in two. Eventually, Coach Pete was rescued and pieces of canoe floated out to sea. Almost a year after our devastating losses, our team was able to raise enough funds to purchase a new outrigger. The new OC6 was named and dedicated to Coach Pete with his personal signature, paw print and Philadelphia Police badge number 8080 displayed on the bow. September 13, 2014, a traditional Polynesian and Police blessing ceremony was held on the banks of the Schuylkill River. There were 75 guests from the east coast boating and police communities in attendance. During the brief ceremonial paddle, one seat was left empty for Coach Pete as a ceremonial Ti Leaf Lei wreath and Flower Lei were thrown overboard in the name of safety for team and remembrance of Coach Pete. A very special thanks goes to all outrigger and dragon boat teams and managers, to include the POCC, PDBA, NYO, NCAWPA and many other paddling teams and members for your kind and gracious support. Our team suffered many losses this year but none greater than losing our beloved Coach Pete. For your unwavering support during a difficult year 2013-2014, we thank you. As the 2016 boat season comes to a close with memories abound and our team in a true esprit de’ corp, begin to prepare for the upcoming 2017 World Police and Fire Games. The 2017 games will be hosted in LA with over 75 nations to be represented.